X-Tronic Soldering Iron Station Model #3020-XTS is a Low Cost, but High Quality ESD Safe 75 Watt Anti-static Soldering Iron Station with some Great Added Features. This Complete Kit is manufactured by X-Tronic for the Beginner as well as the Expert and will Exceed Your Expectations with its Quality & Durability compared to any Soldering Iron Station in its Class. 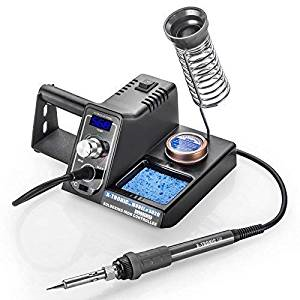 The X-Tronic Model #3020-XTS Antistatic LED Digital Display Soldering Iron Station with 10 Minute Sleep Function, Auto Cool Down, C/F Switch, Ergonomic Heat Resistant Grip Soldering Iron, Solder Roll Holder, Wet Sponge Cleaner Brass Soldering Tip Cleaner and Supply of Cleaning Flux. This X-Tronic unit is a Very High Quality – ESD Safe Digital Soldering Iron unit. The 3020-XTS also features “Magic Temperature Compensation Technology” to maintain tip temperature stability. You can easily change the LED digital readouts from “Centigrade to Fahrenheit” for the Soldering Iron Temperature with a flip of the switch. This unit Features a Blue LED Fully Adjustable Temperature Display, a 10 Minute Sleep Timer, Auto Cool Down Function and a C/F (Celsius/Fahrenheit) Switch. The Soldering Iron Features an Ergonomic Heat Resistant Grip and the Base Unit Features a Side Mounted Solder Roll Holder (Roll of Solder Not Included), a Brass Sponge Soldering Tip Cleaner with a Supply of Cleaning Flux and a Heat Resistant Chrome Coated Soldering Iron Holder.